Varalakshmi Vratam was celebrated on 15th August and I know I am late in posting about it. As you all know I have already blogged about my last year's Varalakshmi Vratam puja and shared some photos with you. 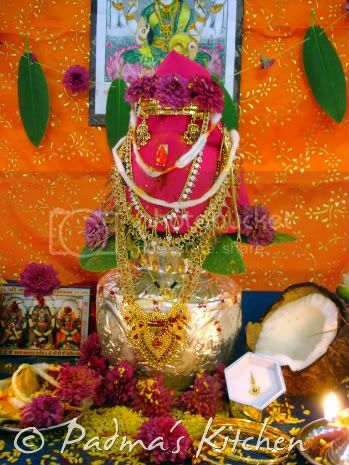 Varalakshmi vratam is widely celebrated across southern states of India., Andhra pradesh and Karnataka. This festival falls on the friday before Full Moon day Pournami/ Poornima in the holy month of Shravan/Sravanam. Lot of preparation go in to perform this puja. I am briefly describing about the puja vidhanama here in the hope that it helps those who are new to this puja, newly wed and married women like me staying abroad. I know there are so much of information on the internet that we sometimes find it difficult which method/vidhanam to choose from. I belong to a Andhra-Reddy family and I am going to describe how Varalakshmi Vratam is celebrated in our family. As I am brought up in Mumbai, I dont know to read and write Telugu, (regional language in India). So it was difficult to find a book on this puja in Hindi or Sanskrit. So I purchased CD on this puja and perform accordingly. If you google it you will find many online links like this one. This Vratam is observed by married women who pray for her husband's well being, good health and prosperity. For any puja the main element to perform is through your bhakti~ devotion. On this day I get up early in the morning and take head bath, dress in new clothes and start cooking prasadam for ammavaru. Its up to you how many items you can make. Usually I usually make 5 types of prasadam but this year I made 7 different types of prasadam - Boorelu, Garelu, Appalu, Payasam, Pulihora, Guggulam and plain rice with pappu. Set a mandapam/place of worship on the east wall of your house. 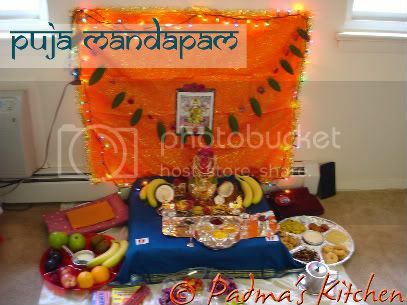 If this is not possible you can do puja in your Puja room too, like I did it last year. Clean the place and if in India we apply cow dung to sanctify the place. Here in US we do not have access to such things, so I used a box, covered with white cotton panchi/dhoti and again covered with silk/pattu cloth. I made star muggu/rangoli with rice flour and sprinkle some Pasupu (haldi/turmeric) and Kumkuma(kumkum) and place some rice and navadhanyalu (nine grains). For Kalasham you can use tumbler made out of bronze, silver, or mud. Take some fresh water in kalasham and add pasupu, kumkuma, gandham, navadhanyalu, rice, few coins, tulsi leaf and flower. Place Kalsham on top of muggu with rice and navadhanyalu. Place five mango leaves in the kalasham. You can use betal leaves and any kind of leaves available. Take a clean coconut and apply turmeric all over. Wrap with a new blouse piece and place it on the kalasham as you can see in my photos. Now your kalasham is ready for puja. You can decorate it with your new and old jewellery, flowers and perform the puja. 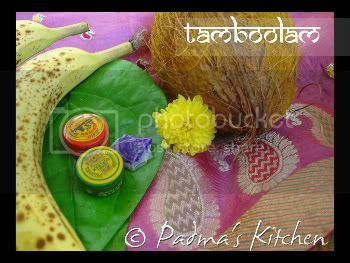 There are many ways to make this puja, like some make puja for Varlakshmi photo, some use Roopam of ammavaru, some make Roopam from turmeric and stick it on coconut. And few do Kalasham puja. Firstly we do Maha Ganapathi puja and then perform Varalakshmi Vratam puja in which you invoke Goddess Lakshmi in 'Kalasham'. We offer our devotion and seek Her blessings. After the puja , I bow (do padanamaskaram) to my husband and get his blessings, goodies (gold or cash). This is my favorite part. 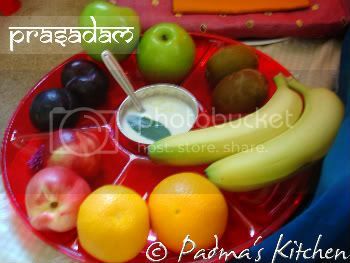 This day I fast till the vratam is over and eat the prasadam offered to Goddess. In the evening we invite friends (married women) and offer tamboolam. At night we perform haarati and move Kalasham three time to left and three times to right thus ending the puja. Next day we sprinkle the kalasham water all over the house and left over we our it to Tulsi or any plant. May Goddess Lakshmi shower you with blessings and fulfill all your wishes. 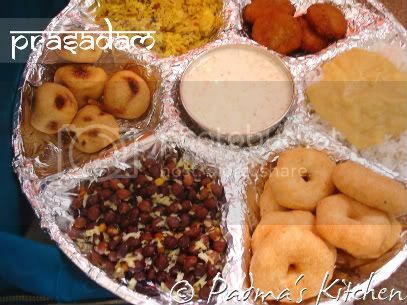 Beautiful decoration :) Love the prasadam plate i mean ur drooling items Padma! to start with Pooja Mandapam chalaa baagundi, Kalsam decoration ayeet adiripoyeendi anukondi.. nenu alaa chalaa sepu choostu ne undi poyanu..really it was looking very grand Padma. inkaa 7 rakala pindi vantalu antaaraaa.. vivahaa bojanm type lo undi andi.. kaaneesam prasadam kosmu ayeenaa akkadaki adey mee intiki vacheyelai ani undi.. ofcourse amamvari deevenalu kudaa teesukuntanu lendi. fruits kudaa chalaa raakalu offer chesaru...anni grand gaa unnayee,.. eesari pics kudaa challaa clear gaa unnayee.. really mee pooja chooste daggra undi chesukunanta feeling vachindi Padma..
inka online taamboolam idi varuku cheppinattu chaalaa new idea and i am glad and very happy to accept ur online taamboolam. nenu next week chesukuntunnanu so appudu nenu kudaa meeku online taamboolam pampistanu..
mee pooja chala bhakti shraddhala tho chesukunnaru kaabatti .. amma vari krupa katakshalu mee andu sarvadaa unadali ani, deergaa sumangali gaa undali ani aseeervadistu mee taamboolam teesukuntunanu andi..
wow padma... i didn't even realise it was varamahalakshmi vrata until my mom called me next day. all pooja decorations and thali look so fab! pooja vidhanam, adi bavundi padma. i really like the plate arrangement. good u made boorelu n garelu aslo. ee sari nenu avvi cheyyaledu. bavundi mi ammavaru. chala baga decorate chesavu. very good. thk u padma. actually compared to last year, e year tondaragane ayyindi. it's all in the dough ra. entha tight ga vunte anta baga vastundi. anyways, ela chesano motham rastanu le.nuvvu kooda baga chesukunnav. 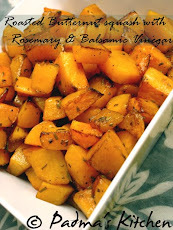 keep visiting my blog ra. wow rocking presentation and great feast!...everything looks simply superb Padma..
first time in ur blog...its so divine and the decoration is too good.. Very nice presentation and decoration of pooja..
in samputi.com site having all the information about kaarthikamasam 30 days pooja procedure and having all the other pooja procedures,vrathas also and having for children rhymes, shathakamulu.and sathyanarayana vrathapooja, dhaamodhara, kedhaareshwara, ksheeraabdhi vratha poojas are also available.in English and telugu languages. audio also available for each pooja, daily panchangam and astrology also available. Excellent padma,sorry inthakalaniki chusanu,kabatti ippude comment chhesthunnanu.Decoration chala baga undhi,prasadam kuda chala baga chesaru.. Thank you so much andi.Nenu kothaga pelli ayina ammayini. Na husband job mulamuga pelli ayina 1 week ee US vachesanu. Naku Vara lakshmi varatham chesu kovalani undhi ekkada. But ela chayalo theledhu. Mi Blog lo chala chakkaga chupincharu and chepparu ela decarate cheyallo ella amma varini koluchukovalo. Onced again thanks andi.Nenu thappakunda mi thambullam svikaristhunanu. amma vari asirvachanalu kuda ponduthunanu. Mi lanti peddavala blessings maku eppudu undali. E sari vara lakshmi vartham rojuna thappakunda ma thambullam swikarinchi mamalani asirwadincha prardhana.